Structured Wiring refers to a whole house network of audio, video, data, telephone, automation and security signals. 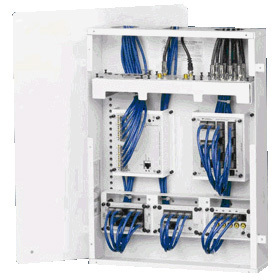 It is the combining of all the communication wiring in your home and treating it as one system. Structured wiring starts with a structured wiring panel which accepts cables from outside providers and distributes signals directly to each room in your home. These lines are called “home runs” and ensure the strongest possible connection and signal to each of your electronic devices. This can include wiring for a home network, telephone, climate control, video, audio, alarms, infrared remote control and anything else you choose. Today’s Home and Leisure Products, Inc. in Mechanicsburg, PA offers in-home consultation and specializes in installing structured wiring and equipment enclosures.